Marea Stamper’s rise to the top of the DJ pack has followed a distinctly old school path. Whilst the current house scene has more than enough fresh faced kids blundering into headline slots on the back of a big single, Stamper has built her career brick by brick, spending over a quarter of a century completely immersed in dance music. 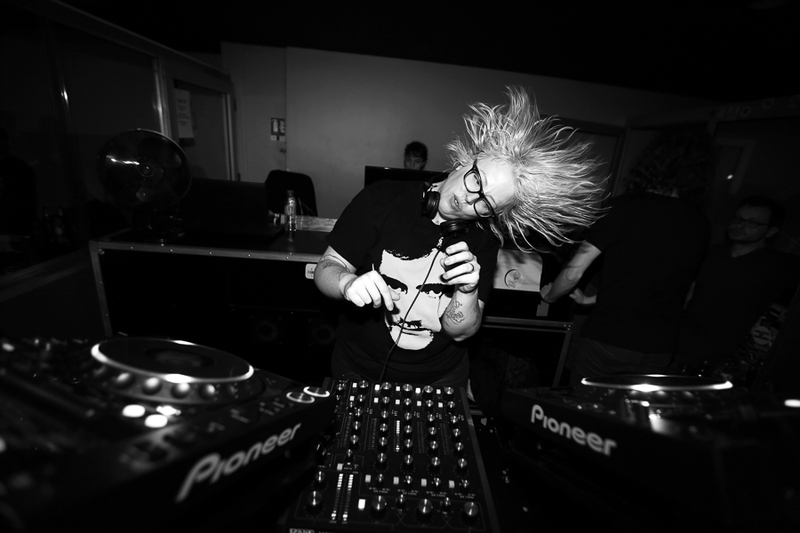 The relatively rapid success she’s had with her Black Madonna moniker masks years of grind, from selling rave tapes out the back of a car as a teenager, to releasing 8-bit techno bangers as Lady Foursquare in the mid-noughties. And throughout all this time she never once stopped digging further and deeper into house music history with an obsession born of love. This ability to respond to the crowd was honed in the toughest of crucibles – playing to the generation spanning house fans who flock to the floor of Smart Bar, a place Marea holds dear to her heart. It’s understandable why Stamper romanticises Chicago – and not just because her rammed touring schedule has been taking her far away from her adopted home town for so long. For someone who lives and breathes house, the city has a magic for her that has never faded. She talks about the m music blaring from every angle; from apartments, radios, even garbage trucks passing in the morning. She points out that in Chi-town, even the cops go raving. Then she drops a revelation. I’m still reeling from learning that the man who wrote ‘An Acid Memory’ spends his days flashing his badge and busting felons, when Stamper, nonchalant about it all, goes ahead and raises the bar a notch or two further. Talk of Obama brings us, inevitably, to the current presidential race. In a dance scene where banal on-brand statements rule the day, Marea is a notable for being unapologetically politically outspoken. This doesn’t always win her friends – there is still a fair large section of house fans who, somewhat bizarrely, imagine that nightclubs exist in a hermetically sealed bubble completely separate from real world issues. This isn’t something, however, that’s going to hold Stamper back from letting the world know what time it is. And when it comes to who she would choose to be the next leader of the free world, she’s emphatic. Attacks on the misogyny in society in general – and in dance culture specifically- have become a feature in interviews with Stamper. But being one of the few figures willing to stick her head above the parapet has proved to be something of a double edged sword. Whilst it’s unlikely that someone with her convictions would ever refrain from speaking out, it must become wearying to be constantly asked questions about issues that are never touched on in an interview with, say, Kerri Chandler. She raises this – and has a solution. “The main thing I’ve been doing is working on this album. The first single will be due in about three weeks – I’m going back to Chicago to finish it. So working is what she’s been doing. A punishing tour schedule has seen her travel ‘round the world and back again– but now that’s coming to a temporary halt. After this year, Stamper has decided to take three months off so she can give fans what they’ve been waiting for since 2014; some new original music. The thing is, even if she’s making an album because she feels that the time is right, rather than using it as some sort of calling card for her DJing skills, dance albums are notoriously tricky to pull off. For a scene that’s bursting with amazing tracks, there’s a distinct lack of correspondingly great albums. How does she plan to sidestep the pitfalls that have sunk so many before? And with that, we wrap up the call – although it turns out we’re not quite done talking. A couple of hours later Marea emails me through a link to an obscure Italo track, something Jesse Saunders sampled in the early 80s, referring to a geeky tangent we’d gone down on the links between Italo and Chicago. She hadn’t been able to remember the track name when we talked, and it had clearly been ticking away in her mind. “I love that this was still bugging you-” I write.